Born at Clarkburg, West Virginia, September 13, 1866, he graduated from the Kenyon Military Academy, Gambler, Ohio, September 8, 1906. He was previously practicing law in Boston in 1891 and moved to Milwaukee, Wisconsin, where he served as U.S. District Attorney for the Eastern District of Wisconsin, 1911-15. He served as a member and general counsel of the U.S. Shipping Board and also Assistant to the Attorney General of the United States. 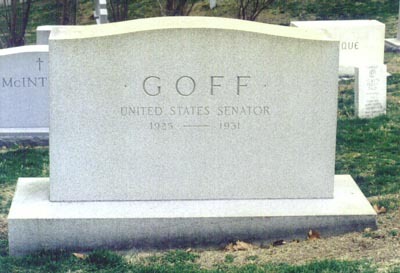 He served in the United States Senate from West Virginia, 1925-31, as a Republican. 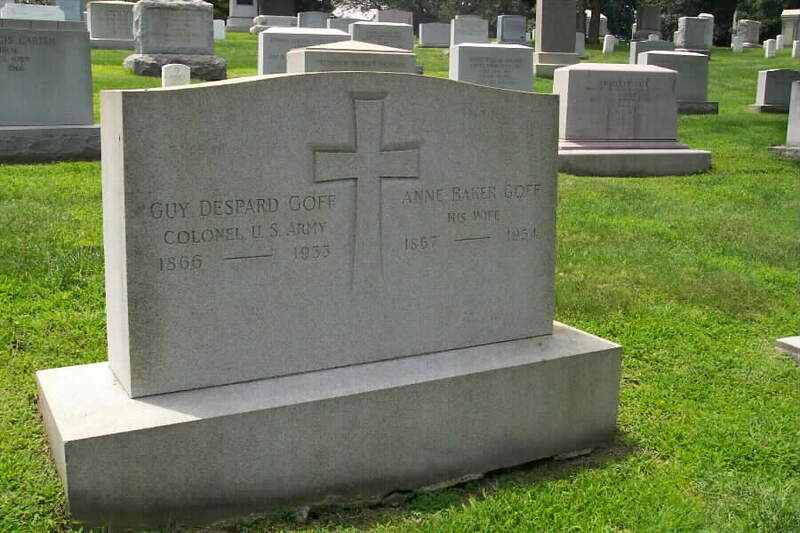 He died at his winter home in Thomassville, Georgia, on January 7, 1933 and was buried in Section 3 of Arlington National Cemetery. 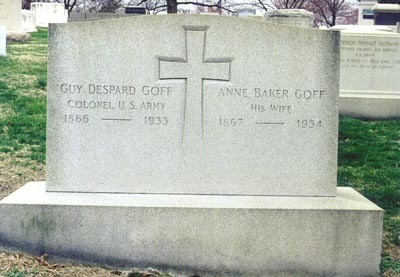 His wife, Anne Baker Goff, 1867-1934, is buried with him. 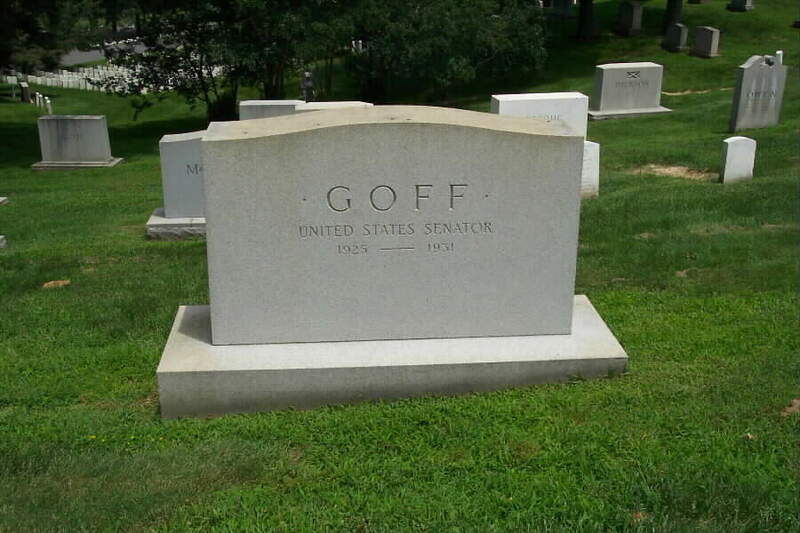 GOFF, Guy Despard, (son of Nathan Goff and father of Louise Goff Reece), a Senator from West Virginia; born in Clarksburg, Harrison County, W.Va., September 13, 1866; attended the common schools and William and Mary College, Williamsburg, Va.; graduated from Kenyon College at Gambier, Ohio, in 1888 and from the law department of Harvard University in 1891; was admitted to the bar the same year and commenced practice in Boston, Mass. ; moved to Milwaukee, Wis., in 1893 and continued the practice of law; elected prosecuting attorney of Milwaukee County, Wis., in 1895; appointed by President Taft as United States district attorney for the eastern district of Wisconsin 1911-1915; appointed special assistant to the Attorney General of the United States 1917; during the First World War was commissioned a colonel in the Judge Advocate General's Department, United States Army, and served in France and Germany in 1918 and 1919; appointed by President Woodrow Wilson as general counsel of the United States Shipping Board in 1920 and later became a member, serving until 1921; appointed an assistant to the Attorney General on several occasions between 1920-1923; returned to Clarksburg, W.Va., in 1923; elected as a Republican to the United States Senate and served from March 4, 1925, to March 3, 1931; was not a candidate for renomination in 1930; chairman, Committee on Expenditures in Executive Departments (Seventy-first Congress); resided in Washington, D.C.; died at his winter home in Thomasville, Ga., January 7, 1933; interment in Arlington Cemetery, Fort Myer, Va.